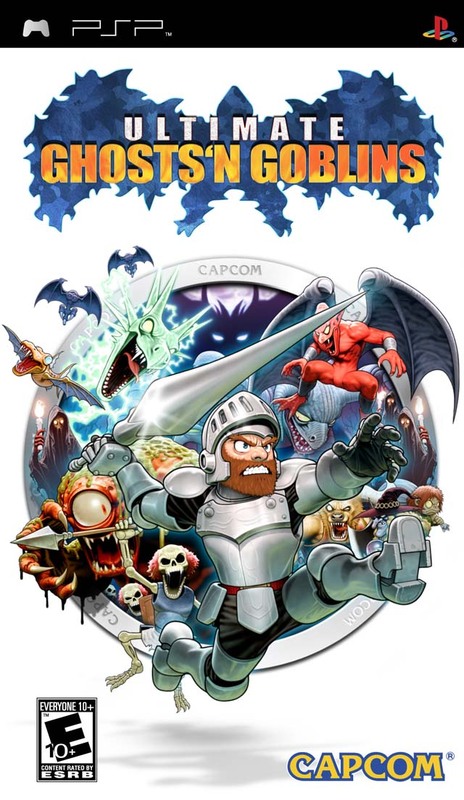 The final review of the month of July is a retro review for a PlayStation Portable game, a re-imagining of the Ghosts 'n Goblins series from 2006. It's Ultimate Ghosts 'n Goblins, and here is my review. Fun for all the right reasons, challenging for all the wrong reasons. When the PlayStation Portable originally came out, Capcom was one of the biggest third-party proponents to the system, releasing everything from Mega Man to Monster Hunter on the system. As the success of its titles wasn't to the publisher's liking on the PSP, Capcom soon invested much less game-wise to the system. However, before just contributing loads of Monster Hunter games on the PSP, Capcom released a new version of its classic Ghosts 'n Goblins series in the form of Ultimate Ghosts 'n Goblins. While an overall worthwhile game to play, Ultimate Ghosts 'n Goblins shows that a developer can stray too close to antiquated old school sensibilities. One of the biggest problems with Ultimate Ghosts 'n Goblins is how controlling Arthur feels as antiquated as back in the '80s and '90s. Arthur's jumps are extremely stiff, not even allowing the player to control the undead-slaying knight while in midair. This makes for an amazingly frustrating experience, especially as there are many times when precision jumping is required. Furthermore, Arthur can only attack in four directions whereas enemies can in from all 360 degrees. 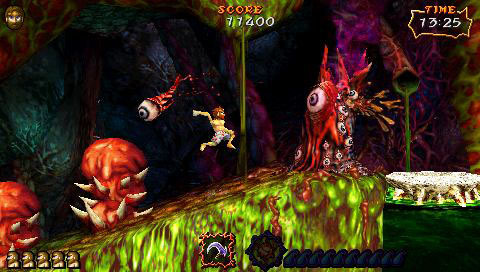 Arthur's movement is slow and prodding, even when he attacks, and while it's nice that Capcom decided to stay true to the Ghosts 'n Goblins series' roots, this would have been one area where improving the controls to something out of the year this PSP sequel was released instead of back in the '80s would have been very much appreciated. 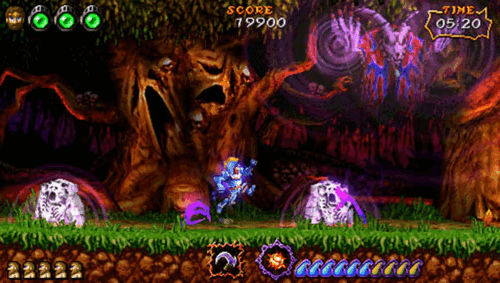 Ultimate Ghosts 'n Goblins is always difficult as a game, as you're ambushed constantly by hordes of monsters; it didn't need to be artificially more frustrating because of its controls. Yikes. This doesn't look like it is going to end well for Arthur. Thankfully, this edition of Ghosts 'n Goblins comes complete with multiple difficulties for beginners as well as those who hates themselves. Novice/Standard mode gives you a number of lives to use, multiple hits to your armor, and the ability to re-spawn nearby from where you die, whether if you take damage while Arthur is in his skivvies or fall into one of the many bottomless pits in the game. Meanwhile, Ultimate mode is a nightmare-level difficulty where no matter what level of armor Arthur is wearing, one hit results in him breaking out into his boxers, and death means you have to start back at the beginning of the level you're currently in. Novice and Standard modes are recommended for all players, as there is still a great level of challenge posed. The inclusion of a helpful save system, allowing you to save your progress after each level, gives this hard game more semblance of fairness. Ultimate Ghosts 'n Goblins has the boxer-toting knight Arthur setting out on a quest to take down the kidnapper of a princess, a nefarious emperor of the Dark Realm. The tale is as simple as "beat the big bad, save the princess", and the narrative doesn't expand from the opening cutscene, but that is just fine for a game of the platforming genre, especially one hearkening back to the classics. Starting off on his quest, Arthur has a suit of armor, the ability to jump, and an unlimited arsenal of lances to throw. Upon coming in contact with an enemy, Arthur's armor falls into a pile off his body, revealing nothing but him in his vulnerable heart-covered boxers. Taking damage then results in Arthur turning into a skeleton and falling down into a collection of bones. However, there are multiple levels of armor to be collected, granting Arthur the ability to be hit more than once before entering his skivvies. In addition to that, the ability to double jump is earned early on in the game, a feature that you won't know how you lived without after getting it. Even just down to his heart-covered skivvies, Arthur is brave against the forces of evil. Besides using a myriad of sharp, pointy lances, Arthur can grab a wide assortment of weapons. When one is picked up, the weapon Arthur currently has is replaced. These range from old standbys like daggers and bombs to new weapons like rose whips and scythes that fly in a boomerang pattern, allowing Arthur to scoop up faraway items in the process. From lances to whips, Arthur's arsenal can be ever-changing. The five worlds of Ultimate Ghosts 'n Goblins throw the book at you in terms of challenge, sights, and obstacles. 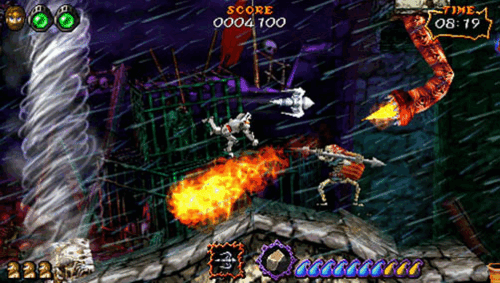 From venturing through the traditional Ghosts 'n Goblins-style graveyard teeming with the undead to exploring the inner workings of a castle, full of moving platforms and deteriorating staircases, Ultimate Ghosts 'n Goblins keeps you on your toes. The initial time it takes to reach the final level for players will take but a couple of hours or so. Then, the game throws a wrench into things, making note that if you haven't collected 21 gold rings, a collectable that most players would think nothing of on their initial journey through the game, you aren't getting through the final door to face the game's boss. This results in you being thrown back to the beginning of the game, tasked with not only acquiring 21 gold rings (there are over 30 to collect, and collecting all of them gives you the best ending of the game), but acquiring various spells hidden in levels to acquire many of these hidden rings. This can make for a tedious time for some players, as the idea of playing through the same levels repeatedly, picking up new spells and rings might not be the most appealing. Plus, many rings and spells are hidden in secret treasure chests that only trigger and spawn upon touching a specific space in a given level. Unless you're a masochist, very determined and unrelenting, you'll most likely need to take up a walk-through posted somewhere on the Web to find the locations of all the hidden "goodies" to be found in Ultimate Ghosts 'n Goblins. One thing I haven't yet mentioned regarding Arthur's most recent adventure is that of the boss battles. These feats of bravery and strength have you taking on demonic entities both small and large, each with their own patterns to be on the look out for. Predictable, yes, but challenging all the same. Speaking of bosses, this bony baddie is the first Arthur comes up against. 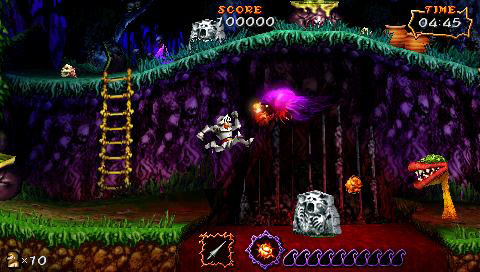 The presentation of Ultimate Ghosts 'n Goblins features 3D models and environments, bringing a sense of depth to the visuals. The amount of detail in the environments and levels is astonishing, and it's all done without looking or being too busy. The performance of the game is solid, offering seldom occurrences of slowdown. Meanwhile, the music features glorious remixed music from past Ghosts 'n Goblins games as well as all-new arrangements. Overall, Capcom went all out with the presentation of Ultimate Ghosts 'n Goblins. 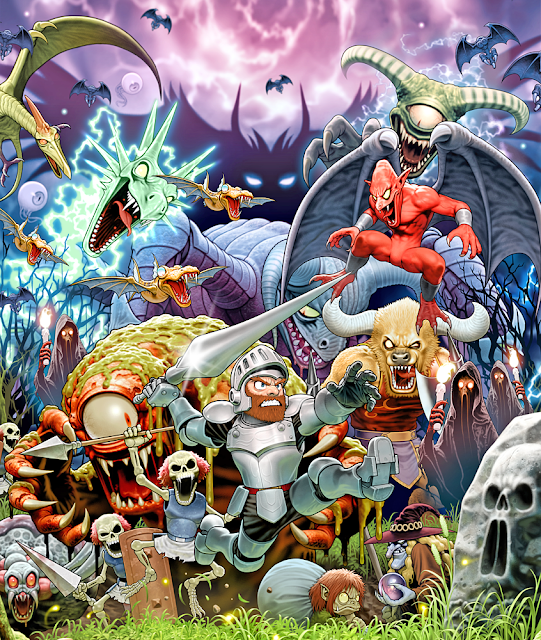 Without question, if you're a lover of immensely hard old school games, Ultimate Ghosts 'n Goblins will give you lots to love and lots of monsters to maul. What it won't give you is tight platforming, controls that aren't stiff, jumps where you can always see where you're going to land, enjoyment from playing the same levels over and over again, and an easy time of things. This is where some gamers might absolutely love Ultimate Ghosts 'n Goblins for these things while others will only get the cold shoulder.